The new year has come and gone, The highlght to our Newyears celebration was to be back in the bush around a campfire drinking champange. We have a trail going into the bush on the other side of the lake, Christine spent a few days before Newyears putting luminarys along the trail and getting the campfire ready. Although it was about 25 below that night we all walked across the lake in the slush about 1/2 a mile into the bush had champange , a campfire and brought in the New Year! Definally a unique way to bring it in . The weather has been all over the place here, a week and a half ago we had 40 degrees F and rain, and this week is going to be lows in the mid -20s to- 30s below F with daytime temps only in the -20s. Saturday was only -10 so I took the advantage of the warmer weather and went fishing, the fish bit so quick I didn't even have time to get cold, had all the fish I wanted in the first 10 minutes. I stay longer so that I could get the fire going and roast my hotdogs for lunch. Yesterday I spent 5 hours on a snowmobile at the local ski hill getting it ready to reopen after the warmer weather and rain. The temps made it all the way into the -20s yesterday and to say I was cold when I got done is a bit of an understatement. 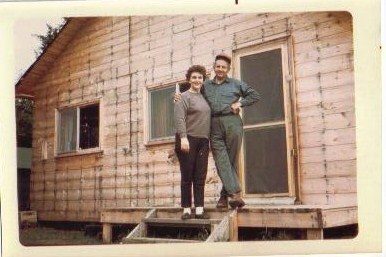 I plan to spend some of the cold weather in my workshop building some cabinets Sue has wanted for a while. 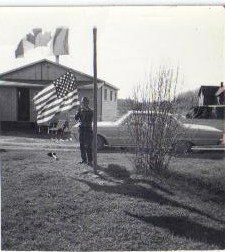 Put a fire on in the wood stove there this morning, but it is not quite warm enough to go out there yet, so I was looking at some old pictures of the camp and thought I would share them with you. Even with the cold it is starting to feel more like spring , people are starting to make reservations for the upcoming summer, looks like people are looking forward to summer again. As for me I am certainly not ready for winter to end for a while! The new office for Paquette's Camp is being built in 1969, it will house the until about the year 2000, at which time it will become my home. 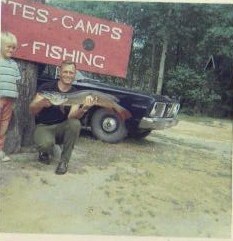 Not sure what year this picture was taken at Paquette's Camp, does anyone recognize the make model year of the car. 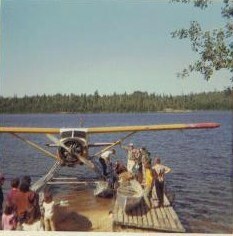 Looks like a float plane came to take someone out for a day trip, they would have tide the canoe to the floats and carried it that way, still the way they would do it today. 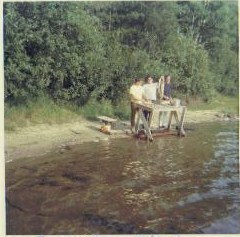 Fish Cleaning house Paquette's Camp 1969! 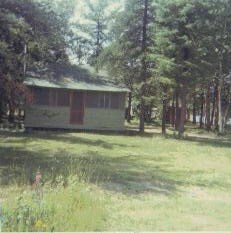 Cabin one in the 1960s with an old Railroad Bunkhouse in the background. 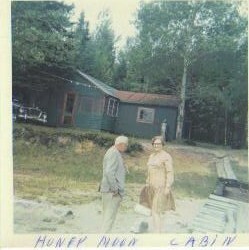 This cabin was also one of the original 3 cabins at Paquette's Camp. 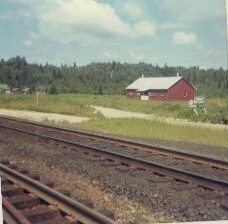 This is what cabin 5 looked like in the 60,s it was one of the original cabins at Paquette's Camp. 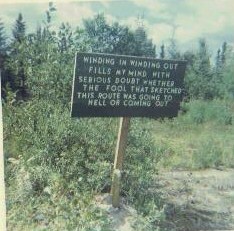 This sign was seen on the Esher Healy Rd on the way into Paquette's Camp in the mid to late 60's , there have been many improvments to the road since. 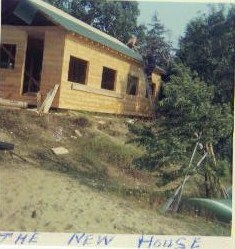 This is the house that I live in being built about 20 years after the camp started.